Had a little misadventure at Watershed today when I went to unload the kiln. The firing was fine, my celadons & iron yellows particularly nice, as were the pots in Waxy White; it's the first time I have used that glaze on brown clay. The rutile blues were a little puny. I'll post some photos, after I have a bath and a nap, because! As I usually do, I drove my 98 Dodge Neon right across the lawn up to the kiln. The lawn didn't look any different than usual; wetter, sure, but not especially muddy. When I was as young as you are, I would have toted those bins right across that expanse of grass, but I am 45 and don't have to upper bod strength that I used to. (Also, one arm still doesn't work quite as well as it should.) Normally this poses no problem, but mid-coast Maine has had a great deal of rain in the last couple of days. I got the car loaded up, but as I was backing out, the front end suddenly dropped about 10 inches, and the tires just spun uselessly. Each tire had been engulfed by its own miniature sinkhole - caused perhaps by mole tunnels? We don't know - so the chassis was resting on the ground, the wheels up to the axels in mud, where there had previously been turf. Watershed's director, Tyler Gulden, came out to push, but the tires had nothing to grab on to. Jenipher Cooley, the adminstrative assistant (herself glowingly pregnant), brought her Jeep around to pull me out, but we couldn't get to the tow hooks, as there was no space between the front end and the ground. I dragged out the little toy jack that came with the car, but the ground near the tires was so soft the the jack mostly managed to push down Maine a little bit, without raising the car much of any at all. At last there was nothing for it but to call a mechanic, who came out with a giant jack and a winch. The car popped right out, fortunately, and it only set me back $40. Q the wonder dog waited patiently on the back seat throughout. I want to shout out a special thanks to Tyler and Jen, who took time out of their busy day, and got muddy while Watershed has no running water due to a power outage. You two are real troopers. Don't touch that dial! Pots later. Come On! It's MUD...... You are a POTTER....... REALLY, What is the issue? Now that totally sounds like something that would happen to me. And being a much older (47) I'd have given up and left it there til spring. Of course here in Minnesota, we won't see any mud yet for months. Glad to hear it all worked out. We briefly considered just covering it with clay and calling it an istallation. That picture up top hooked me right from the start! Ha! 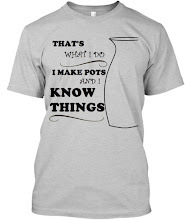 I'm sure your pots look fantastic, like all your other work! Post pics soon, please! Liveblogging the Great Clean Up!